The final outcome of your breast augmentation is dependent on a series of choices that—along with Dr. Karlinsky—you will make in the time leading up to your surgery. The fill, shape, and profile of the implant are all important factors to take into consideration as well as its size, fit, and proportion. Just as each of these is an important decision, so too is the surgical technique. As per technique, there are two major considerations: implant and incision placement. The incision allows for the implant to be safely and accurately placed within the breast pocket. The placement and size of the incision is dependent upon your pocket size, as well as the size of the implant. While no one incision is necessarily better than another, there may be an incision that is best for you. 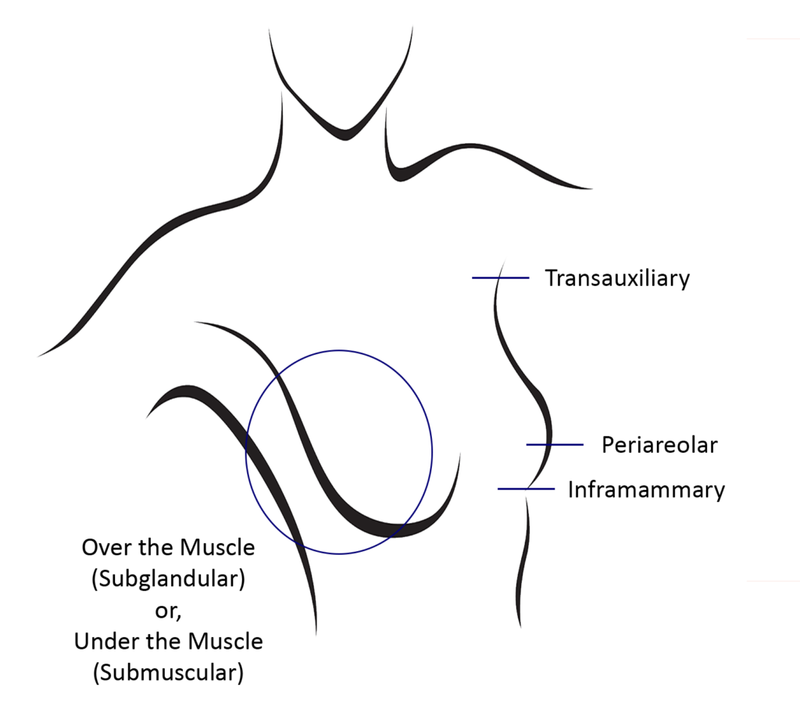 Transaxillary: The transaxillary technique places the incision discreetly within a woman’s armpit. A small pathway is made from the incision to the breast, where a pocket is made before the implant is placed. Many women enjoy that this technique allows their breast to remain scar-free. Periareolar: Made around the lower half of the areola, the periareolar technique is ideal when a breast lift is performed in conjunction with breast augmentation or for saline implants. As the incision runs along the outline of the areola, the resulting scar is generally well hidden. This technique is not the best choice for women with exceptionally small areolas or for women who have chosen a larger implant. Inframammary: The most commonly performed approach in the United States, the inframammary technique places the incision within the crease under the breast. Tucked beneath the breast fold, exposed scarring is minimal. The inframammary technique gives Dr. Karlinsky great access and visibility as she places your implant within your breast pocket. Your implant may be placed either over or under the pectoral muscle. Traditionally, under the muscle placement has served to create both natural looking, and feeling breasts post-augmentation. The muscle serves two purposes: provides additional soft tissue coverage, as well as holds and shapes the implant in relation to the upper breast. As advancements have been made to the breast implants themselves, there is no longer such a strong need for submuscular placement. Better holding their own shape, silicone implants can reside over the muscle, while shaped implants lend to a natural slope and silhouette. Silicone also better mimics the feel of real breast tissue—giving the breasts a suppleness that was not was possible when a saline implant was placed over the muscle. There is no opinion more important than that of a board certified cosmetic surgeon—like New Look New Life’s Dr. Karlinsky. As a board certified cosmetic surgeon, Dr. Karlinsky will use her expertise to create a surgical plan that is in line with achieving your goals. Highly skilled and well-experienced, Dr. Karlinsky is careful to include you in this process.